Newborn photography is so special.... you are creating memories for two parents that their family will remember for a lifetime. Documenting those special newborn moments is wonderful but can be tricky! Celebrity family photographer Julia Boggio has been photographing babies and families for over 12 years. Her work in the photography industry has helped her to become the photographer of choice in the London luxury market. HELLO! Magazine did an interview with Julia to discuss baby photography, and get her top tips for doing your own baby shoot at home and we thought it would be perfect to share some of her tips with you here today! What's the perfect age (weeks) to do a shoot with a newborn? "Newborn photography ideally needs to happen within the first 10 days of life. After this time, they start spending more time awake, which makes them harder to pose. With twins or babies that have come a little early, this time frame can usually be extended." How do you keep a baby calm/sleep and not crying during the shoot? "Timing the shoot to begin after feeds is a good place to start. Keeping the room warm, almost uncomfortably so for you, can help the baby relax, especially if you want to get shots where their clothes are off. It’s also a good idea to play some white noise or heartbeats on your phone as the sound is comforting to babies (after all, it was all they really heard for nine months)." How long should a shoot last? "There is no perfect amount of time for a newborn shoot to last. I've had shoots go anywhere from two hours to eight hours. It all depends on the baby's temperament. There are often long breaks for feeding and lulling the baby to sleep – this can't be rushed." What essentials do you need to create a 'photo studio' in your own home? "The most important ingredient is light. You don't need to have professional flash, but you do need a window with good light. If the light is too bright (like direct sun), have some white plastic shower curtains on hand to tape up on the glass to help make the light a bit softer. If you want to take pictures in the baby's crib, move it next to a window. You can also use pillows or layer lots of blankets on the floor in the window light to make a nice comfortable spot for baby." Is it possible to do a baby shoot at home like a pro? "Yes and no. You can get simple, natural-style images at home, but the more complicated, artistic portraits require an advanced knowledge of lighting, posing and, most importantly, safe handling of newborn babies." What shoots are the most popular with parents and why do you think they are so popular? "In the first year, most parents will see me three times (four if you include a pregnancy shoot). Newborn shoots are special because the baby is so new and beautiful. However, the baby will quickly change and soon will look nothing like that cuddly bundle you brought home from the hospital. My favourite time to photograph babies is between 6-8 months in a studio setting. The key is to do it when they are sitting up steadily, but not yet crawling. You can have lots of fun dressing them up or photographing them with their rolls of fat (which also disappear way too soon). Finally, there is the first birthday shoot, which sometimes involves baby's first taste of cake (also known as a Cake Smash Shoot). Some babies absolutely love it and some act like you are feeding them cow pats. It's always hilarious and always yields great photographs." "Both my great-grandfather and my grandfather in Italy were photographers, so it's always been in my blood. I didn't discover my own passion for it until a trip to South America in 2000. When I returned, I enrolled on a course in photography on weekends while I worked as an advertising copywriter. Eventually, I decided to turn it into my career and now I've been a full-time professional photographer for 12 years." Are there any memorable images or shoots you can share with us? What made them so special? "Proud parent alert – I really adore photographing my own children. They are my muses. In fact, ideas I have for them are often the ones that I then turn into shoots for my wider client base. Earlier this year, I won Children's Portrait Photographer of the Year at an international photography conference for a Fine Art photograph of my daughter hugging a giraffe (I'm holding a Menagerie Fine Art Shoot Day on September 16, where I can capture images like this for clients). The feeling I get every time I look at that portrait of her gives me shivers. It's timeless and beautiful. I want my clients to get the same feeling when they look at my photographs of their own children." What are the best/most popular props for baby shoots? "Trends in newborn photography are always changing. 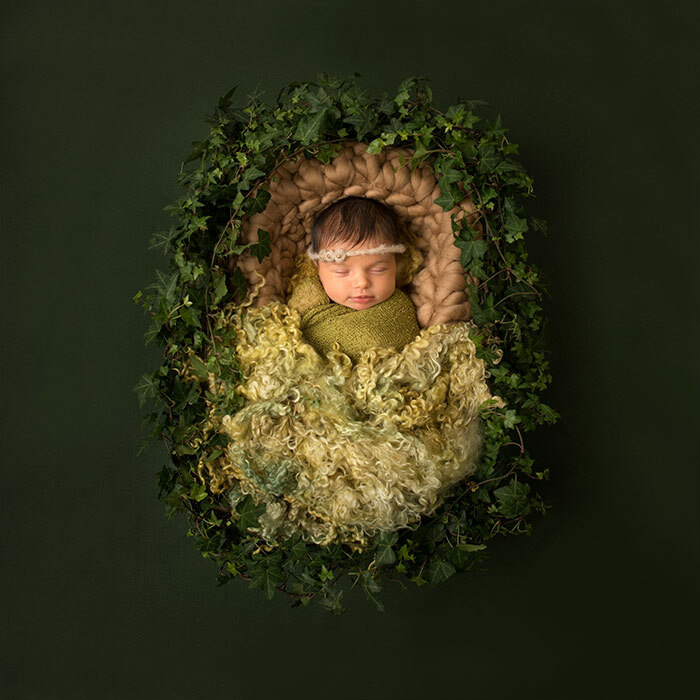 Right now, using flowers and greenery in newborn shoots is popular. However, cute hats and outfits will never go out of style. The first thing to decide is whether you like things neutral or bright and then shop for blankets and hats accordingly. If you love shots of the baby with cute hats on, then you can purchase them on places like Etsy (just make sure to do it in plenty of time in case you want things shipped from other countries)." For more adorable baby pictures and to find out more about family shoots visit boggiostudios.com. If you have an interest in birth photography and fresh 48 sessions but do not know where to start, you have got to check out this new video course "Birth Photography & Fresh 48 Workshop" by celebrity birth photographer Heather Mohr. In over 188 minutes of video, you will learn everything you need to know about photographing in a hospital setting including shooting, lighting, editing, client interactions, pricing and more. Get this guide today for $29.99 (a $129.99 value)! GET THE "BIRTH PHOTOGRAPHY & FRESH 48 WORKSHOP"